This elegant bust of a young woman was created by the acclaimed sculptor, Affortunato Gory (Italian, fl. 1895-1925). Affortunato Gory (also known as Fortunato Gory) studied under the sculptor, Augustor Rivalta, at the Accademia di Belle Arti in Florence. At the turn of the century, he moved to Paris, and he began exhibiting at the Salon des Artistes Français in 1902. Gory is best-known for his mixed-media sculptures of beautiful young women. 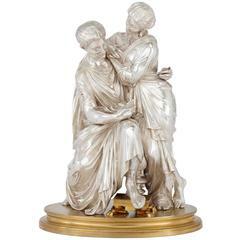 By combining different materials, such as ivory, gilt bronze (ormolu), marble and alabaster, Gory gave his work a sumptuous, luxurious quality. This bust is signed ‘A Gory/ Paris’. The sculpture takes the form of a white marble head of a woman, who looks off to the right into the distance. The woman is dressed in a gilt bronze (ormolu) ruffled bonnet and bodice, with an embroidered neckline and frilled sleeves. The bust is set on a black-green marble socle, with a square base. This is placed on a tall black-green marble plinth, which is decorated with foliate ormolu bands and an ormolu vase motif on its front. A bust of a woman signed by Gory, France. Face in marble, hat and bust bronze-mounted on a red marble stand. Early 1900s French bronze bust on a marble base. Great original dark patination with neoclassic style marble base. Measures: 17 inches tall. French bronze and multicolored marble bust, circa 1878. Signed by artist L.Gregoire.